How much more could have been achieved for equality and civil rights had it not been for the escalation of the Vietnam War? This is the quintessential question that remains after reading Daniel S. Lucks’ book “Selma to Saigon”. Over the last several decades numerous historians have examined the Vietnam War as well as the successes and problems of the civil rights movement in the 1960s. Moreover, topics related to the Vietnam War and its effect on African Americans have also been studied extensively. 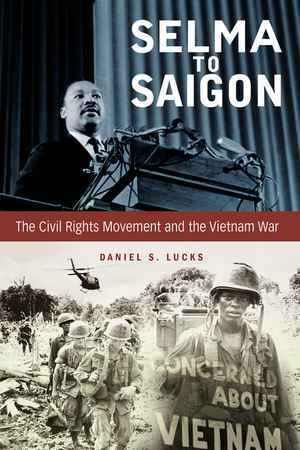 Although these studies point to the growing fissures within the African American community and civil rights movement on the Vietnam War, they do not achieve the depth that Lucks does. Based on meticulous research of a wide array of sources, Lucks paints an intense picture of the Vietnam War’s effects on the civil rights movement and Lyndon B. Johnson’s civil rights activism. In seven chapters, the author convincingly shows that the Vietnam War “eclipsed all other issues, including civil rights” (p. 2), “exacerbated preexisting tensions in the civil rights coalition along generational and ideological lines,” and “diverted the fervor from the movement for racial justice at home.”(p. 3) The Voting Rights Act of 1965 was for many African Americans at the time “second only to Abraham Lincoln’s Emancipation Proclamation”. But, it also came to be the last major achievement in civil rights, as Lyndon B. Johnson escalated the U.S. military engagement in Southeast Asia. Lucks positions his monograph in the context of the long civil rights movement and the effects of the Cold War on the struggle for civil rights. While not fully refuting the idea that the Cold War also helped civil rights , the monograph ultimately supports the argument brought forward by historians such as Jacqueline Dowd Hall, Brenda Gayle Plummer, and Penny von Eschen that the Cold War stymied civil rights success and severely weakened the civil rights movement. The first two chapters introduce the reader to African American anti-colonialism, the peace movement, and the beginnings of the American involvement in Vietnam. According to the book, the origins of the Vietnam War lie in the Vietnamese anti-colonial struggle colliding with the U.S.’s “abandonment of the principle of self-determination for colonial subjects.” (p. 21) The American anti-communist hysteria, which resurfaced in the 1940s, not only severely limited the government’s foreign policy strategy, but also weakened the civil rights movement and anti-colonial activism. The evolvement of the Cold War silenced these critical voices of American foreign policy. Embracing the Cold War consensus oftentimes for reasons of self-preservation, the majority of African American civil rights activists rejected and excluded left-wing activism in the 1950s. Between 1954 and 1965, voices critical of U.S. foreign policy and colonialism reemerged only cautiously. The chapters that follow chronicle the African American community’s struggles with antiwar sentiments between 1965 and 1968. With the growing investment of American troops and money in the Southeast conflict, support for civil rights began to falter as predominantly white leftist groups, above all the Students for a Democratic Society (SDS), began to focus on the war. The general public including African Americans remained very critical of the antiwar forces and considered them disruptive, communist-inspired radicals. But as the American death toll rose, the war increasingly became a source of contention. The Student Non-Violent Coordinating Committee (SNCC) was one of the first civil rights organizations to develop a disdain for the war in Vietnam. They picked up the anti-colonial stance of earlier times and developed strong bonds with the peace movement. To them, racism at home and racial oppression as well as imperialism abroad represented the same thing and needed to be fought together. By 1966, Stokely Carmichael’s fervent advocacy of Black Power and the general radicalization of younger civil rights activists made cooperation with the predominantly white New Left and peace movement more difficult and also thwarted collaboration with the more moderate civil rights movement. The urban crisis and rise of violence in western and northern cities like Watts and Chicago complicated the fight for civil rights further. Frustrated and obsessed by Vietnam, President Johnson and white Americans in general increasingly relinquished civil rights advocacy. The majority of African Americans refrained from criticizing the war and America’s increasing military intervention. Moderate civil rights organizations, above all the National Association for the Advancement of Colored People (NAACP) fronted by Roy Wilkins, closely cooperated with President Lyndon B. Johnson in their fight for civil rights. They supported Cold War liberalism and anti-communism and shied away from criticizing the President’s foreign policy and remained convinced of its righteousness. Moreover, the majority of African Americans still considered service in the nation’s military a patriotic act that would lead to racial equality. The picture Lucks paints of Martin Luther King’s struggle with the Vietnam War is especially riveting and challenges the civil rights activist’s status in American collective memory. In two chapters, the author shows in detail how torn King was between successfully cooperating with Johnson and publicly opposing the war and the President’s strategy. King grew increasingly frustrated with Johnson’s civil rights advocacy after the slowdown of civil rights reform and turned his attention to poverty and inequality in urban settings. Still hoping that progress under the current administration was possible, he continuously albeit grudgingly refrained from openly disputing Johnson’s war strategy thereby losing not only the President’s support but also the sympathy of the majority of black and white Americans who, until 1966, still supported America’s war efforts. As “the political risks of opposing the war were dwindling,” (p. 188) gruesome pictures of the effects of America’s military intervention on Vietnamese civilians were the final straw that ended King’s reluctance to protest the war publicly. He did not embrace the more radical actions of the peace movement like burning the draft card, but his opposition to the war gained him respect among the young generation of activists and further strained his relationship to the moderate and older wing of the civil rights movement. Throughout the monograph, Lucks remains rather unsympathetic to moderate civil rights activists, although he admits that substantial change was brought about by lobbying and legislation rather than mass protest (p. 213). Despite their obvious embrace of the Cold War consensus, so-called moderate civil rights activists and black commentators proved more critical of American foreign policy and the Cold War in the 1950s, as many historians generally admit. The monograph would have benefitted from more rigorous editing, as it would have prevented repetitions in content and style that can be found throughout. This criticism, however, does not diminish the importance of this in-depth study of the stultifying effects of the Vietnam War on the civil rights movement and the expansion of civil rights and equality in the United States. The civil rights movement, as varied as it was before the onset the American military involvement in the Vietnam, further diversified and split due to the war in Southeast Asia. A younger, more radical generation of activists broke ties with the moderate wing over the war and Johnson’s politics. James Westheider, Fighting on Two Fronts: African Americans and the Vietnam War, New York 1997; James Westheider, The African American Experience in Vietnam: Brothers in Arms, Lanham 2007; Herman Graham III, The Brothers of Vietnam: Black Power, Manhood and the Military Experience, Gainesville 2003; Lawrence Allen Eldridge, Chronicles of a Two-Front War: Civil Rights and Vietnam in the African American Press, Columbia 2012; Kimberley Phillips, War! What Is It Good For? Black Freedom Struggles and the U.S. Military from World War II to Iraq, Chapel Hill 2012. Voting Rights Bill is Most Significant Move For Negroes in 95 Yrs., in: Cleveland Call and Post, 14.8.1965, p. 1A. E.g. Mary L. Duziak, Cold War Civil Rights: Race and the Image of American Democracy, Princeton 2000. See e.g. : Jacquelyn Dowd Hall, The Long Civil Rights Movement and the Political Uses of the Past, in: Journal of American History 91 (2005), pp. 1233–63; Brenda Gayle Plummer, Rising Wind: Black Americans and U.S. Foreign Affairs, 1935–1960, Chapel Hill 1996; Penny von Eschen, Race against Empire: Black Americans and Anticolonialism, 1937–1954, Ithaca 1997. New assessment of the Black Panther Party and the myth of racial exclusivity: Joshua Bloom / Waldo E. Martin, Jr. Black against Empire: The History and Politics of the Black Panther Party, Berkeley 2013. On African Americans and the Korean War: Christine Knauer, Let Us Fight as Free Men: Black Soldiers and Civil Rights, Philadelphia 2014; Michael C. Green, Black Yanks in the Pacific: Race in the Making of American Military Empire after World War II, Cornell 2010. Christine Knauer: Rezension zu: Lucks, Daniel S.: Selma to Saigon. The Civil Rights Movement and the Vietnam War. Lexington 2014 , in: H-Soz-Kult, 30.09.2015, <www.hsozkult.de/publicationreview/id/rezbuecher-23472>.